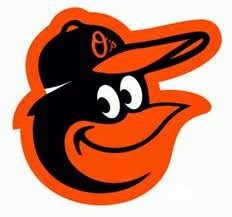 Yesterday the Orioles defeated the White Sox 8-2 in a MLB record setting game. The stadium was empty--no fans were allowed to attend the game due to the unrest in Baltimore. A game without fans? The players demonstrated that baseball is our national pastime whether fans are allowed or not. Further--this weekends home series between the Orioles and the Tampa Bay Rays has been moved to Tropicana Field in St. Petersburg, Florida, where despite not being in Camden Yards, the Orioles will be the home team for statistical purposes. the series promises to set records for low attendance as it it much too far for the Orioles faithful to make last minute plans to attend. Yes, it was still a game. This weekend's series will still be games as well--it is just that the local fans do not get the enjoyment of seeing our team in person. I was having trouble understanding understanding the decision to play a fan-less game, so I did some digging. 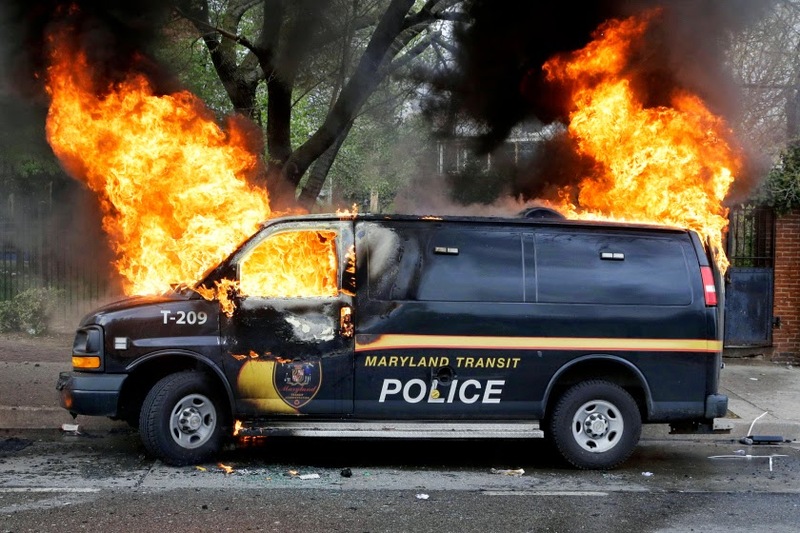 Turns out, it was because the Orioles did not want to dilute the police and security forces protecting the city to be at the game for crowd control. I hadn't thought about it like that before, but it does take quite a large security force to keep us all safe when we attend sporting events. "Everything in life, this too shall pass. Something's bad if you keep repeating it. We hope to take out of it a starting point for our city." Yes, I am at a hotel near Denver looking south across the plains to the mountains and the ever increasing urban sprawl. It is amazing how different the scene can seem separated by a day. Even separated by a day, however, the effects of the drenching rains can still be seen in the huge puddle in the overflow parking lot. Both images were taken in the morning, just about sunrise. One day dawned rainy and cold with only the promise of more rain all day. The next dawned cold but clear and ended with sunny and bright skies. Yesterday's ending was far more spectacular than I would have imagined. I enjoyed dinner at the ViewHouse Restaurant in Centennial, Colorado, and was treated to the spectacular sunset as I was leaving. I could not pass up taking a quick image of it--the colors were fantastic and placed an exquisite exclamation point on the end of the day. Today promises to be an even better day! 1. Weekends pass too quickly. There always seems to be more things to do than time to do them. 2. Flying is becoming like being packed in a cattle car. Has anyone flown on a plane lately with an open seat next to them? 3. Although I missed the game because I was at a wine fest, the Pirates, Jax's baseball team, won their first game in dramatic walk-off fashion! It is fun to be coaching in a league where the scores actually matter. 4. 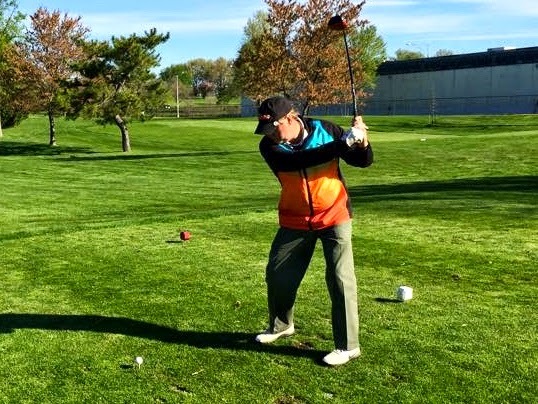 I got to play nine holes of golf yesterday morning. It was nice to be out on the course. I played miserably--but that is golf. I'll do better next time. I am learning more and more every time I venture out. Weirdly, yesterday I did best on the par 3's--they usually are my toughest holes. 5. Prayers and support are needed for the people of Nepal after the earthquake and aftershocks. 6. I just have to write it--the 18 runs the Orioles scored yesterday are the most in a single game since 2006. I hope they didn't use up the whole weeks allotment of runs. Dogs have a way of expressing themselves even without words. Yesterday, while we were stopping by Patrick and Tina's house to drop off Makayla for a play day, two overly rambunctious dogs--Chewie and Warren, had to be separated from the larger group. 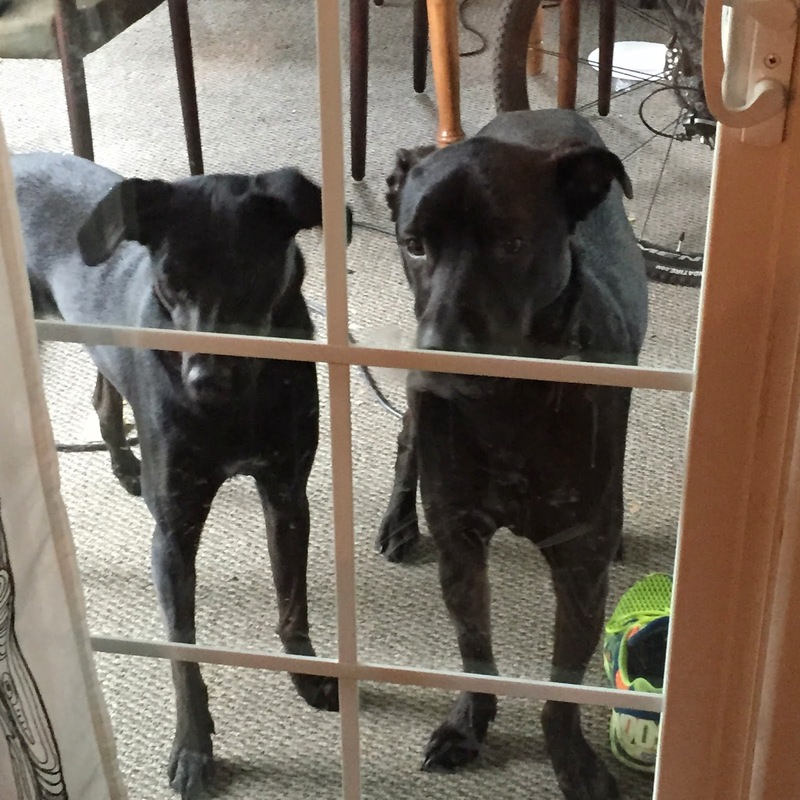 Realizing the error of their ways, they stood at the door hoping be reunited with the group. To no avail. Makayla was sitting next to me, quietly enjoying the respite from her high energy companions. But Chewie and Warren were clearly repentant. Really? Is that anthropomorphism? I think so. But they were cute standing at the window hoping to be allowed to rejoin the group. Another day in the life of a dog. Friday evenings are perhaps the best of the entire week when I gather with friends to put the exclamation point on the end of the workweek and cast a glance forward to the weekend. It is a rhythm to living that I have grown accustomed to repeating--in a good way. There is something about getting together over some great munchies and some nice wines to compare notes and relive highlights and low lights of the week. It is therapeutic, truly, to be with friends who really care about what is happening in each others lives. 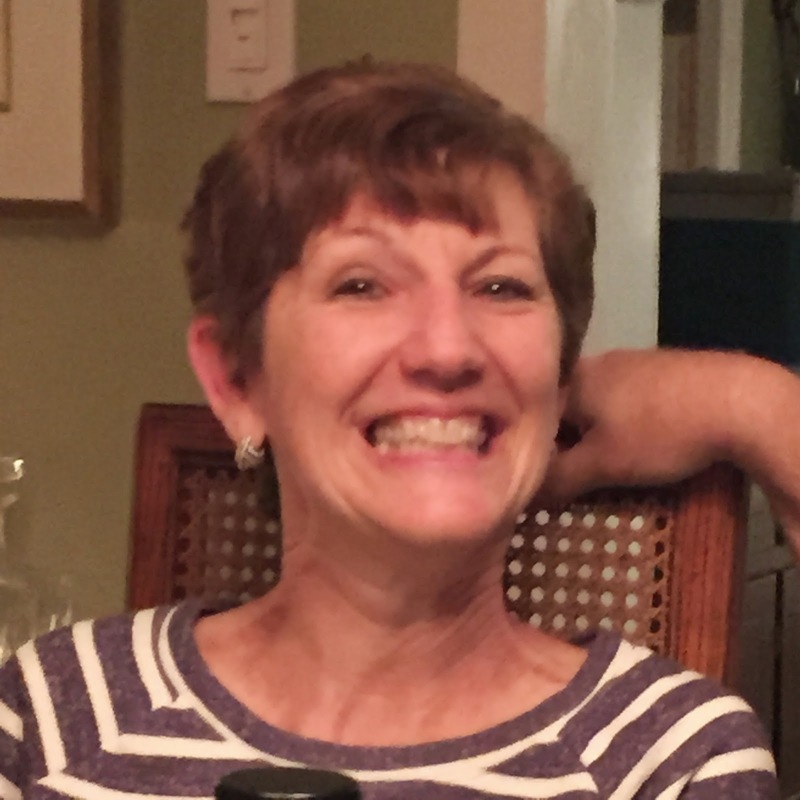 I took some candids last evening of us sitting around--eight friends, one week, and, yea, a couple bottles of fine wine. Bring on the weekend--we can conquer anything! It dawned upon me last evening about 7:30 PM, as I was warming up the grill with a couple of pork chops, that the daylight is truly lasting longer. 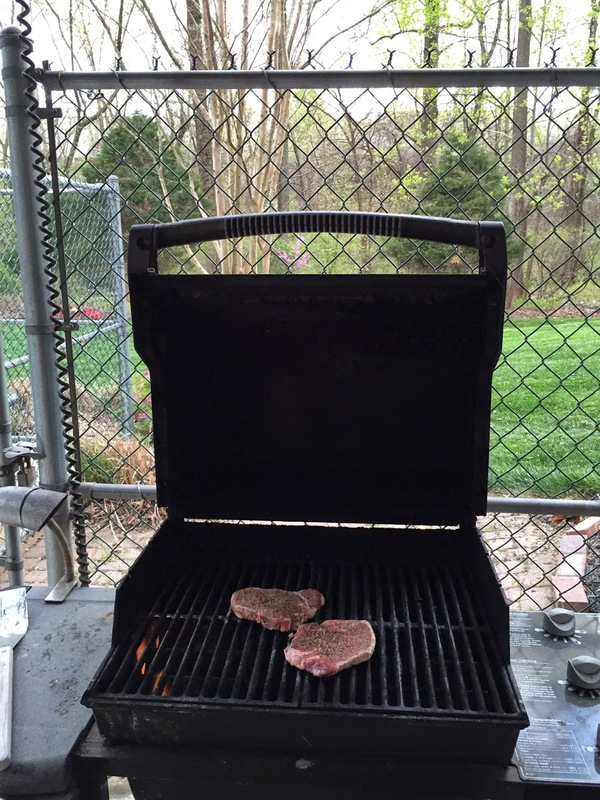 It was just two months ago that I would have been grilling the meat in darkness--illuminated by only the porch lights. It stopped to snap a picture of the scene to remind myself that this is what the best part of the year is all about--living outdoors. Now if only the temperatures would become more seasonable. It is 37 degrees this morning as I write this with an expected high in the high 50's for the day. I was thinking of taking Cat, my jaguar, out today--but the top is still down from the last time it drove it. Ugh, it is cold. And I know Upstate New York received snow yesterday. 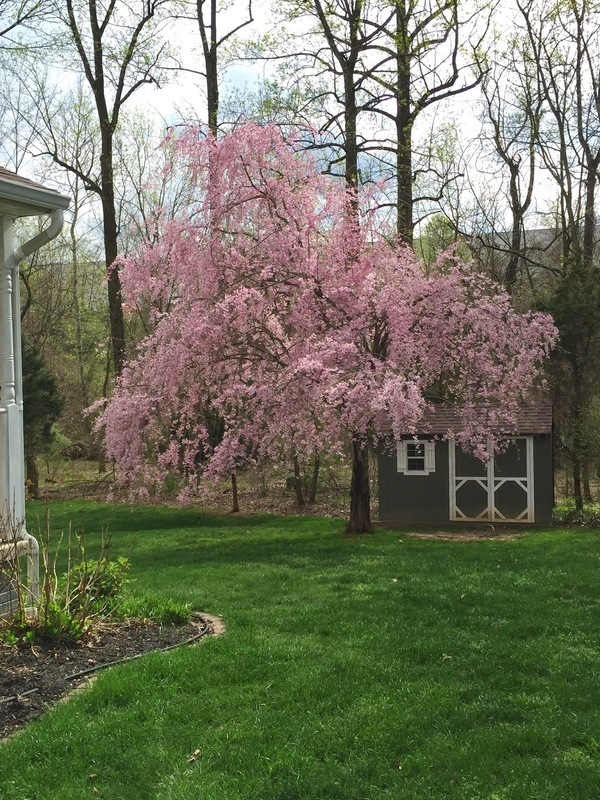 At least our redbud tree is in bloom. 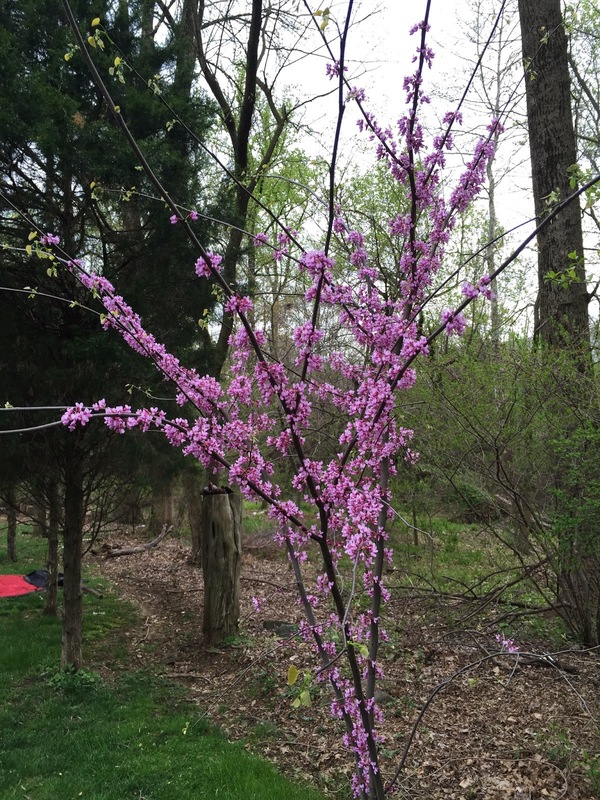 As I was doing some research, I discovered that tradition has it that Judas Iscariot hanged himself from a redbud tree. Wow, it is amazing the things I learn when I go deeper into the background of the things I am writing about. If Spring would ever take control of the temperatures, I would get ready to open the pool and start the slide into summer. But--with the continued cold, there truly is no rush to uncover the pool. I guess I will have to be content with the signs of the season which appear around me on a daily basis and be happy in the knowledge that warmer weather is coming, even if the thermometer doesn't indicate that it is here, yet! I had not considered a hammock for many years. They are not one of those backyard adornments that interest me. 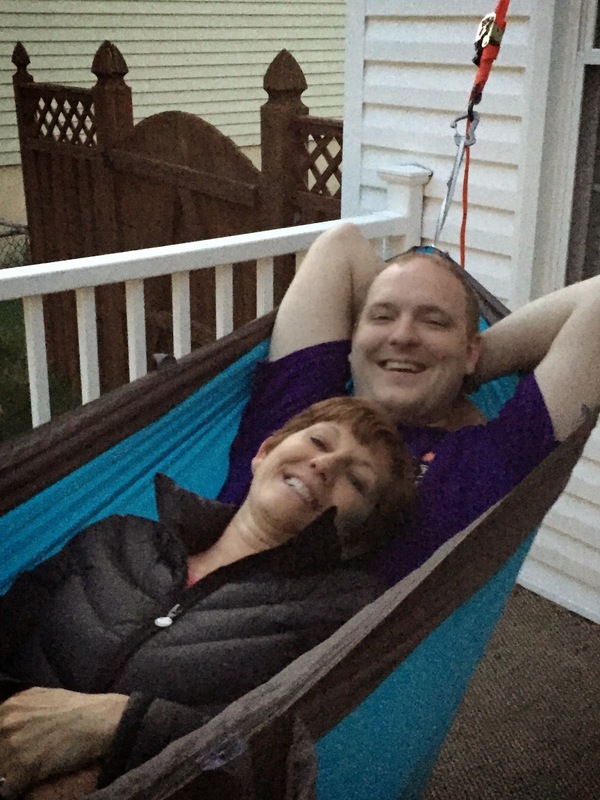 I was introduced to a new hammock concept at Patrick's which interests me enough to investigate further. This hammock, unlike to traditional ones, is very portable and was also very stable. I was able to get into and out of it without getting intimate with the ground. I am notoriously unbalanced in hammocks and this one was very stable. The other problem is experience with hammocks are flying insects, a/k/a mosquitos. This hammock, I am told has an optional mosquito net--which is an absolute necessity for my yard which is bounded by a wild area containing water and sufficient quantities of mosquitos to sustain a brown bat population for decades. I wish I had remembered the name of the company which produced this variant. At least I took a picture. One of the joys of the Springtime is sleeping with the windows open allowing the air conditioning to be off and fresh air, with pollen, to fill the room. Fortunately my allergies are fairly well under control this year and I can actually enjoy the fresh air, but there are sounds that happen during then night which disturb my sleep and cause me to be cranky in the morning. For instance, last night it was the sound of a screaming fox, probably a vixen, walking up the driveway right below my window. Of course, Makayla had to alert me that there was commotion outside and begin barking which caused the cats to stir and become agitated. It takes time to go back to sleep and get everyone settled after the offending animal has departed the area. Of course there are other sounds which can disturb the house in there middle of the night as well and which are enhanced by sleeping with the windows open. Planes taking off on the little used runway which seems to fly directly over my house. 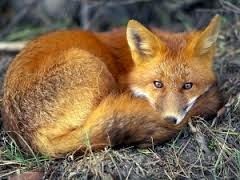 Thunderstorms--like the one last night that followed the fox incident. Of course, the sound of the cat spitting up a hair ball is especially bothersome and occurs whether the window is open or not. Maybe tonight it will be quieter. 1. According to Lucas, it is two and a half movies from Baltimore to Pittsburgh. 2. With 12 games played and 150 to go in the MLB season, the Orioles are holding up well and are tied for first in the AL East. 3. Why is the Social Security system so complicated? 4. I mowed my lawn for the first time of the year this weekend. It was a great experience to be on the tractor again. It was fun mowing under the canopy of our weeping cherry tree. 5. 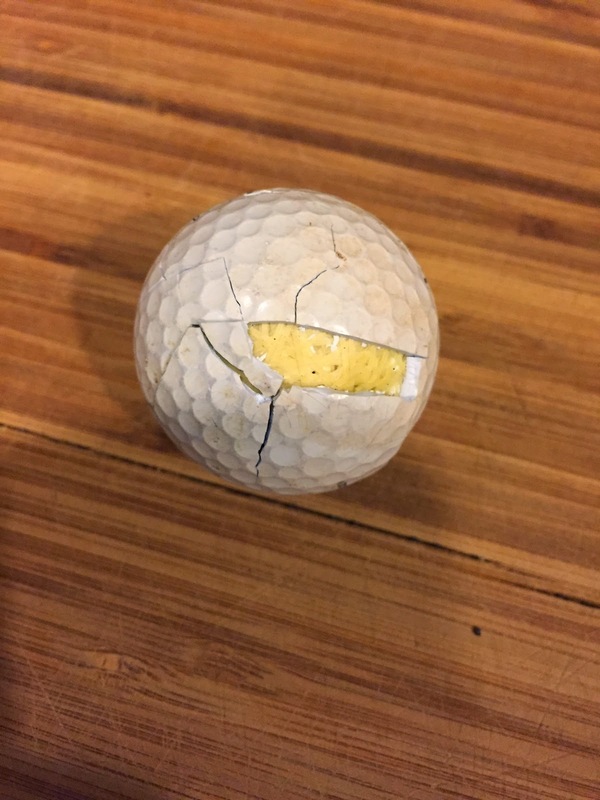 Golf can is a frustrating game. I played a round yesterday expecting much better results than I received, but being out on the course made everything better. 6. I am enjoying watching the Springtime flowers blossom. 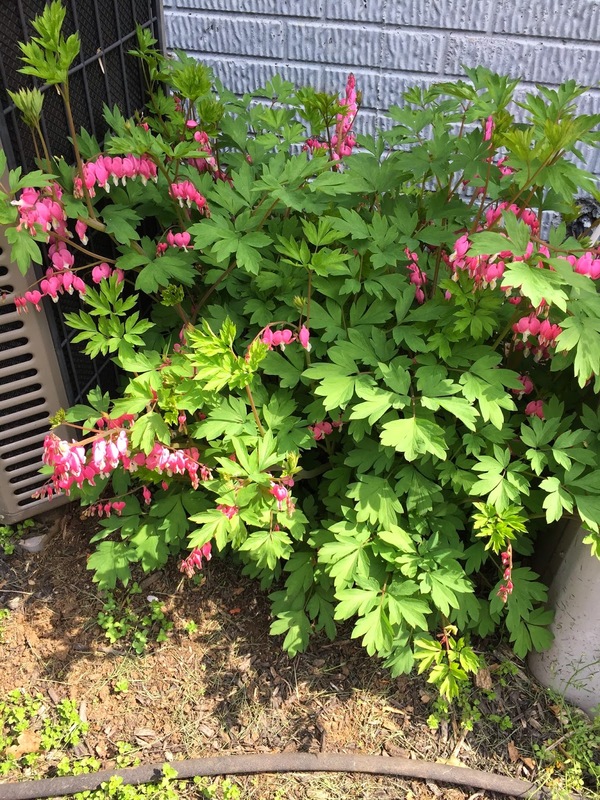 My bleeding hearts are huge--they grow so quickly. 7. It is Monday--I'm not sure if that is a good thing or not. 8. Why did gas prices jump almost 15 cents per gallon for the weekend? When asked, I often say that Saturday is my favorite day of the week. I enjoy the ability to plan my own day and accomplish anything, or nothing, as choose. It is freeing. Until yesterday--it was the Saturday with too much to do! It began innocuously enough with my morning interface with my computer to write my blog. 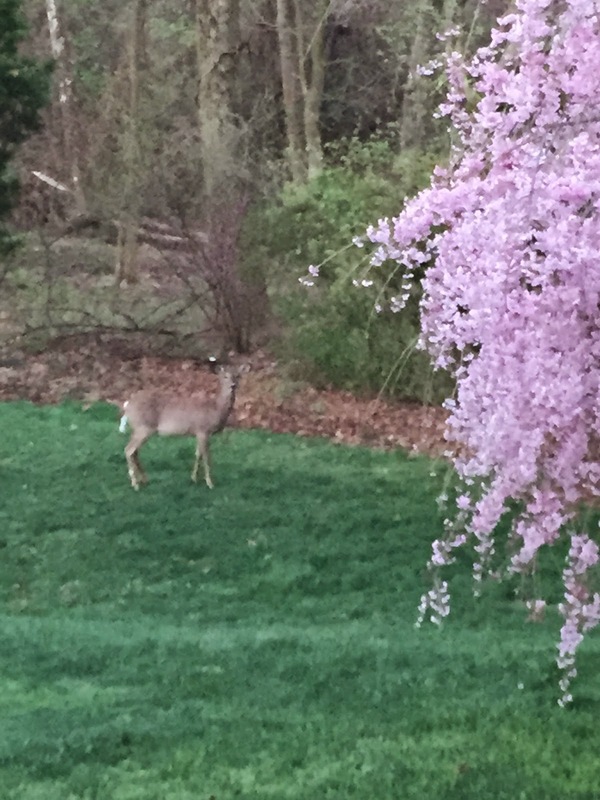 It was fun taking the image of the deer in the yard and relaxing with my coffee for a few minutes. And then the day really began. 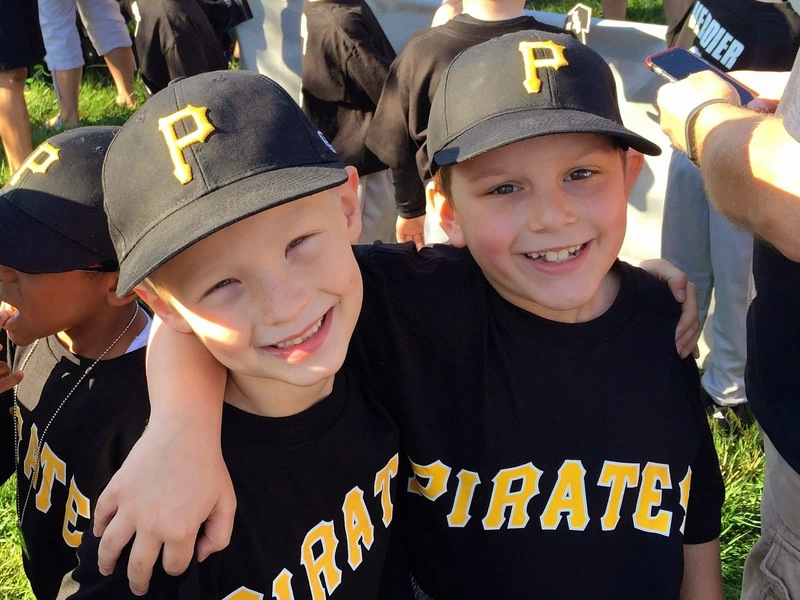 The was the opening day parade for the Jax's baseball team, the Pirates, which began at 8:30. Depart the house at 8:30 so as not to be late. That ended about 9:30 and then it was back to the house to get some of the springtime chores accomplished. I did get my first lawn mowing of the season accomplished! But wait! There is always more to do. 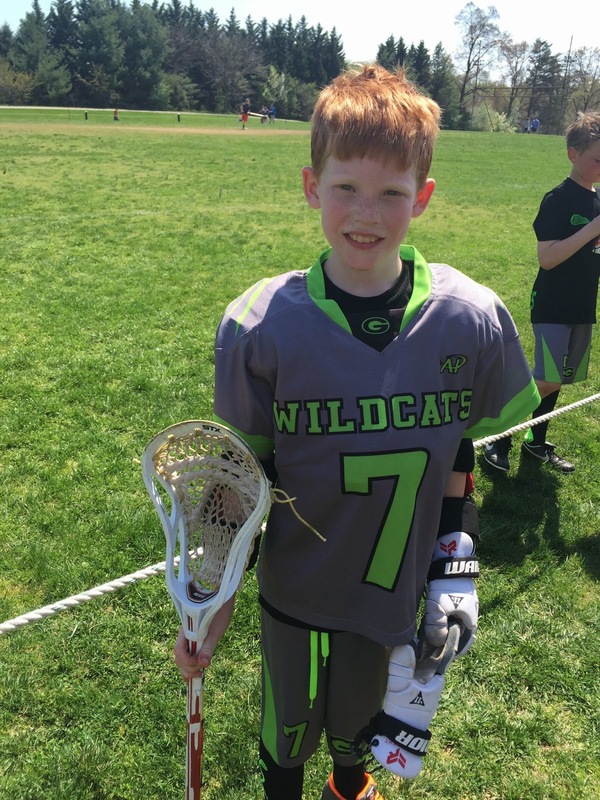 By 12:45, I was back on the sports fields watching Ethan and the GORC Wildcats play lacrosse. It was quite a match which GORC won 8-5. Ethan nearly had his first score of the season as an attacker--which was pretty exciting. Then it was back to the house--remember it is about 20-25 minutes each way from Odenton, where the games are played, to the house. I had time to accomplish more projects and to relax a bit. But, I had to be on the baseball field at 5PM for the Pirates opening day game! Although the Pirates lost, it was a lot of fun seeing how the boys had advanced and how they are coming together as a team. Jax made some great plays in the field and there are a lot of positives that we are going to be building upon. By the time Chris and I got back to the house, for the third time of the day, it was time to relax--for the evening. Dinner, some TV, and early to bed because we were both exhausted! Let's do it again, next week! 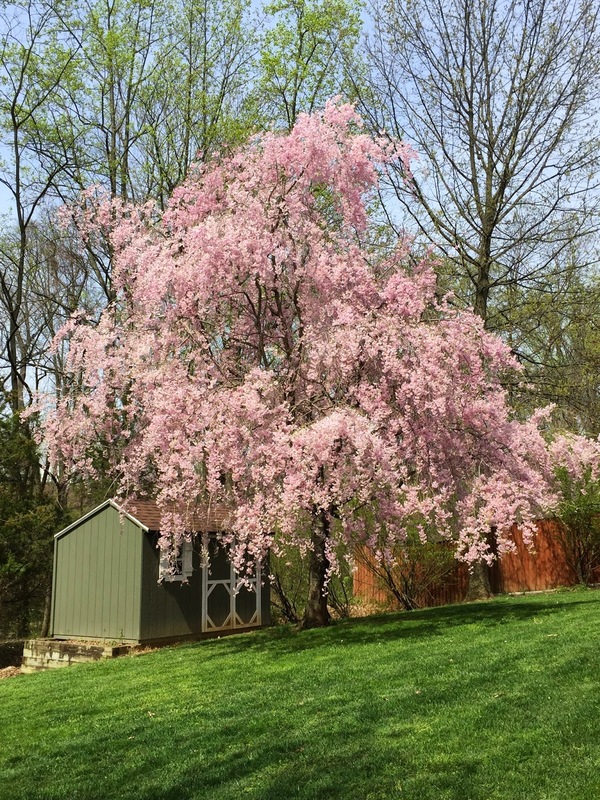 Yup, in the symphony of Springtime it is time for the arrival of one of the big kahunas--the weeping cherry. Flowering trees are everywhere now. They have literally exploded during the past week and the region is alive with what I call the ice cream cone season--the puffs of color on tree trunks all along the roadsides. I can begin to see leaves on trees as well. Yup, it is Spring, finally. I love them. My allergies don't particularly appreciate them--but I'm making due this season. The lawn will be mowed today for the first time--in my view it is almost one month later than normal. During a more normal year I would be considering opening the pool, but that is at least two weeks off yet. Pool time will come soon enough--but I do want to get the cover off the pool and begin to enjoy the warmer days! At least it's not snowing like it was when I was in Salt Lake City. What a stunning difference a day, or two, can make when looking out the hotel window. When I first looked out the window of my hotel room, and for the first two days of my trip to Salt Lake City, the scenery was obscured by the Springtime snowstorm that engulfed the area. Who really knew what was there? All I saw was the snowstorm that held the region in its grip, snarling traffic and bringing cold and misery to the area. And it was cold--temperatures in the 30's and 40's. During the storm I removed at least six inches of snow from my rental car. Because of the elevation and the relative warmth, the snow fortunately did not accumulate on the ground, else the region would have been completely shut down. I could tell that Spring had truly arrived, however, because the trees had leaves on them--not fully mature leaves, but leaves that were well into the process of bring Spring to the region. As I drove around, I could see the flowering trees were in flower--they were covered in snow--but, flowering nonetheless. As it turned out, once the storm subsided on the morning I was departing, the scene outside my hotel window was stunning! I was so impressed with the view when I arrived at the airport to depart, that I snapped a quick shot of the city of Salt Lake City nestled at the base of the mountains from the airport. There is a lot wrong with this image--the reflection on the glass for instance, but I was never able to get another opportunity to take a better one. Why do the good things always seem to happen when I am leaving? At least the trip home was uneventful! And there is no snow--hopefully I am finally done with snow because it seems that Winter doesn't want to end. Regions of the country seem to possess a unique character. I notice it as I travel, but I always notice it more when returning to Ithaca, NY. Things are just different there. Perhaps it is the influence of the Cornell and Ithaca College or perhaps it is caused by the flower children of the 60's who never grew up, But Ithaca is a different region. Whatever the reason--I almost always see something while visiting the Ithaca area which causes me to take note. 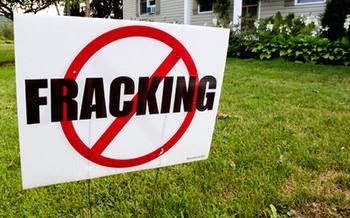 I have grown used to the no fraking signs--they are old by now--but still prevalent. 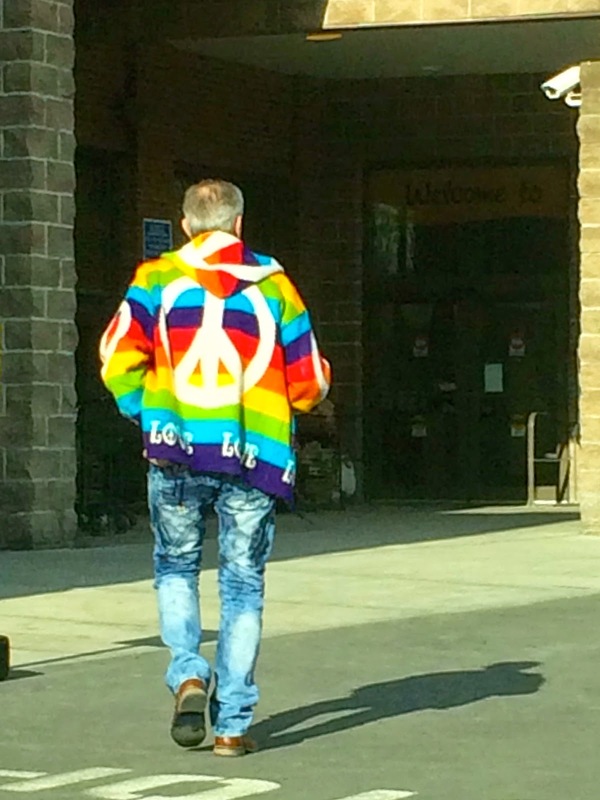 Chris snapped an image of a man in the rainbow-colored jacket emblazoned with a "Peace" symbol walking into the local Wegmans. What a unique mixing of social issues from different eras. I can't recall the last time I saw a peace symbol. And I know I have never seen the "Peace" symbol from the 60's anti-war movement juxtaposed upon rainbow flag colors currently associated with the gay rights movement. Wow--there certainly were a lot of issues in one jacket and one image taken by Chris on a Saturday afternoon in Ithaca, NY. I have not been to Salt Lake City, Utah, in many years. I do remember that last time it was summer--and that meant warm. I remember wandering around the Temple Square looking for ice cream! Outside my window yesterday, as I arrived, it was snowing. What a shock to my system. I stood in the window in disbelief that snow could be falling from the mid-April sky. I have heard, and remember that there are mountains around here somewhere--they were not visible due to the snow. So I am not sure what is truly the scene outside my window except for a view of some business buildings. 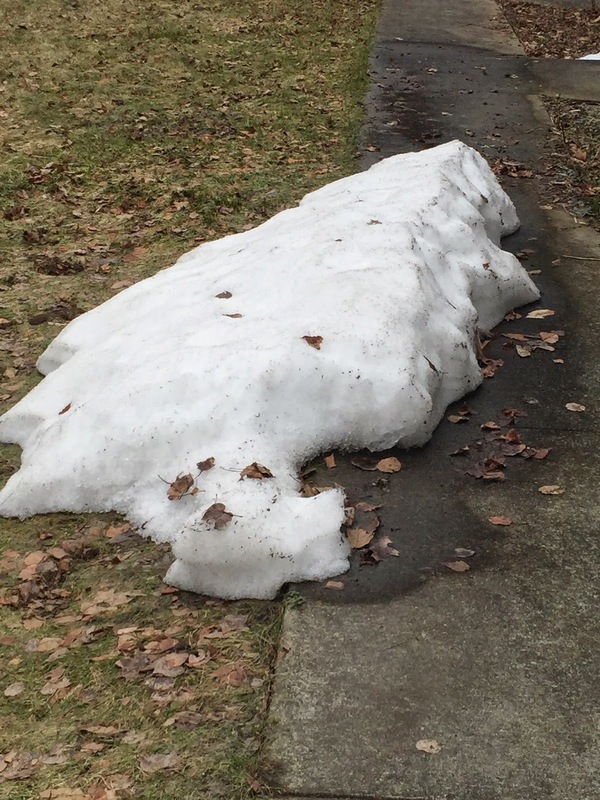 It is time for winter to be over--seriously. 1. Some places within a five hour drive of Baltimore still have snow! I even took a picture of some of it. 2. The Orioles are unsettled as they are now six games into the regular season and carrying a 3-3 record. 3. I am continually amazed at how the trees begin to leaf by showing signs of green--and then the leaves arrive! Come-on Spring. Let's get busy. 4. I'm amazed at how many people are already running for President--and the election is not for another 19 months. 5. 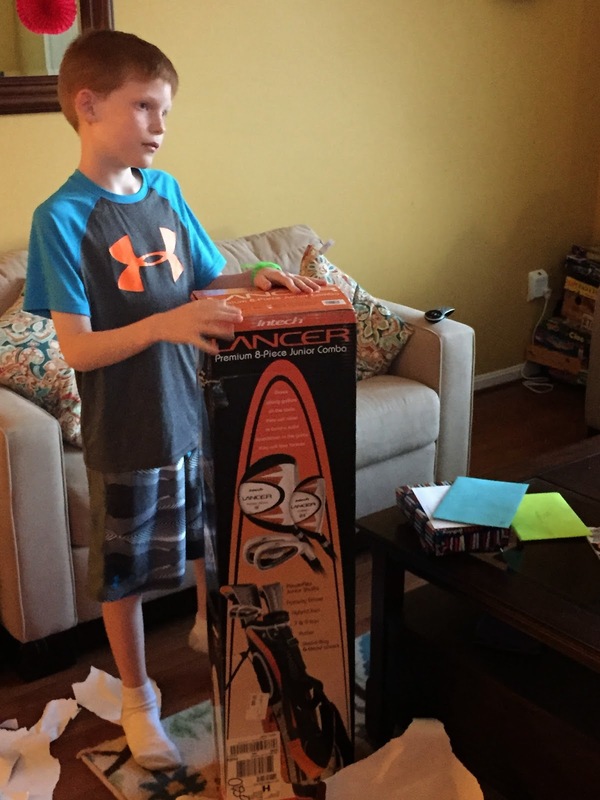 10 is a great age! Happy Birthday Ethan. It must be really cool to share a birthday with Thomas Jefferson. 6. I was excited about the Masters Golf Tournament, probably because I have a new appreciation for golf. Congratulations Jordan Spieth! 7. It was good to get back to Maryland after a cold and quick weekend in upstate New York. It is at least warmer here. The crowds were gathered in anticipation of cheering their team onto victory on Home Opening Day. It was an awesome and orange sight. The faithful, numbering some 45,000, gathered and the teams were introduced. I was in the stands as part of the cheering throng. Despite the threat of thunderstorms, the game was played and the storms never materialized. Everything was fantastic--right up until the game actually began, I got some great video of the opening day festivities and the singing of the national anthems. After that, it was apparent the the Orioles may not have fully arrived for the start of the game as they rapidly spotted the visiting Blue Jays to a four run lead in the top half of the first inning. 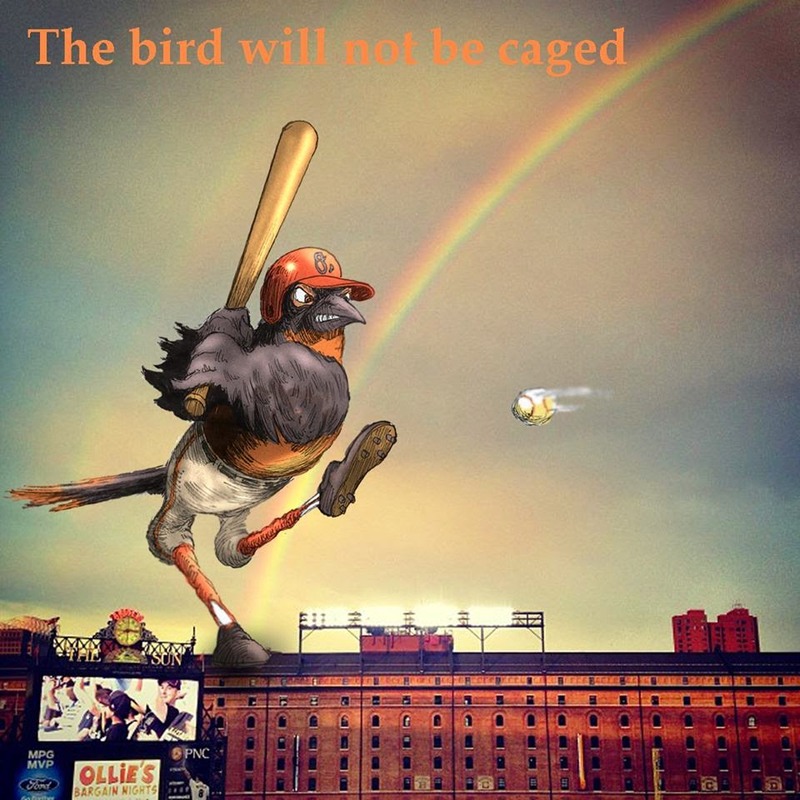 The game quickly got out of control, and I have to admit some of the Orioles tried very hard to get back into the game--but the damage had been done early and the final score on a disappointing home opening day was 12-5. The Orioles did manage 13 hits and Adam Jones was 4-4, and three other Orioles were 2-4 on the day. The hits just did not come when they could produce runs in the same way that the Blue Jays hitters were able to generate 12 runs from their 16 hits. But it was fun to be back in Camden Yards and to enjoy the sights and sounds of baseball. There are still 158 games to be played. IT is going to be a long and fun season. The season is off to a great start. 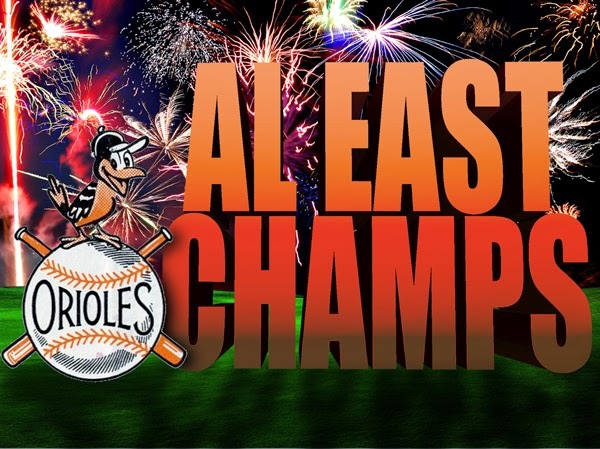 The Orioles have won their first series with some great pitching and timely batting. 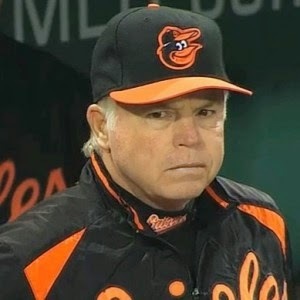 Someone joked after the first two wins that the Orioles were on track to win 162 games this season. That of course could not last as last evening's loss was a dose of reality. The season is very young and there is a long was to go--but the Orioles are fanning the flames of high hopes with the way they've begun. The home opener is on Friday--and even with the foul weather forecast, I will be there with tens of thousands of other Orioles faithful. I'm really excited about the day and the game. There is something fantastic about attending the first game of the season and participating in the festivities as the team is introduced to the surging home crowd for the first time. The greatest fans in baseball, they call the crowd--and we are! I remember not too long ago when it was easy to get tickets and even extra tickets for opening day. This year, however, I know that there are season ticket holders who were not able to secure tickets for the game. My how the fortunes of the game have changed. With the arrival of April, the evenings are getting warmer and more pleasant. 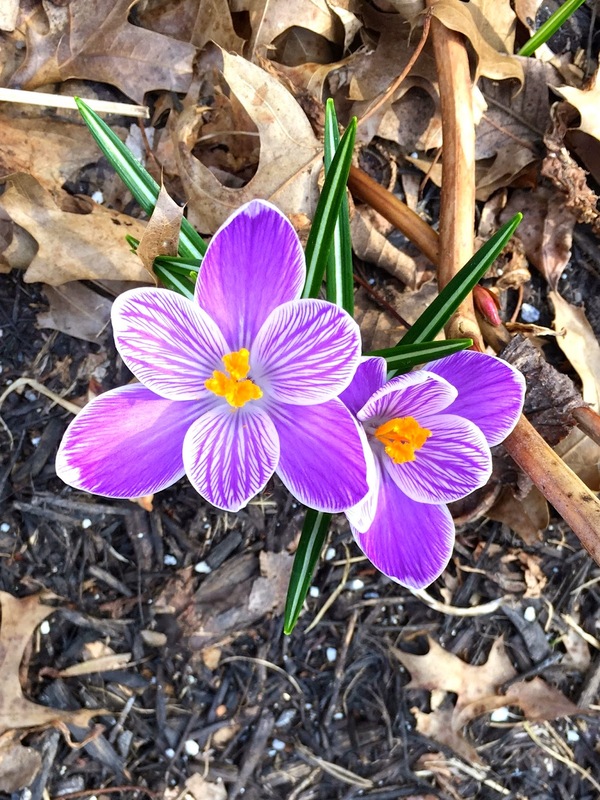 The rebirth of the region after the unreasonably long and cold winter is evident everywhere. 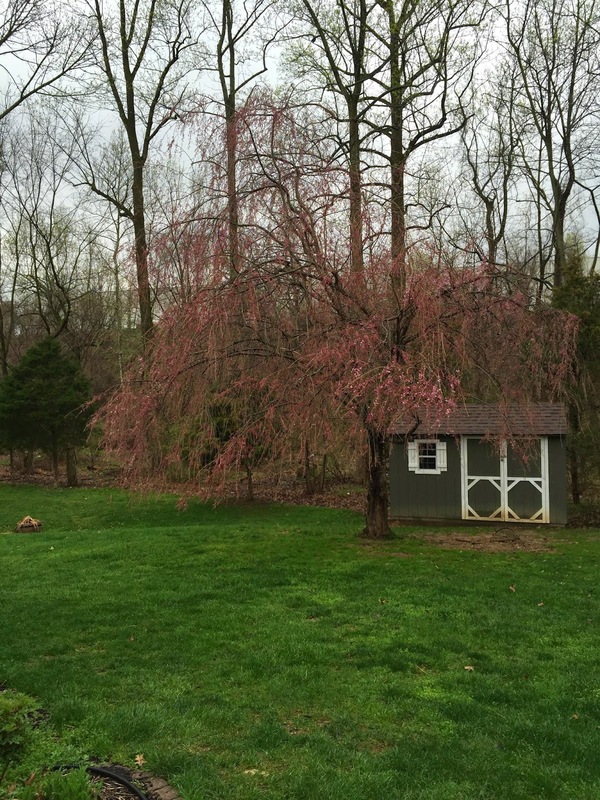 I saw the buds on the weeping cherry in my yard yesterday. Some Easter's this tree is in full bloom--but this year because of the snow, the blossoms are behind schedule. It is going to be beautiful when it does finally bloom. It is amazing how I look for the new signs of Spring every day. 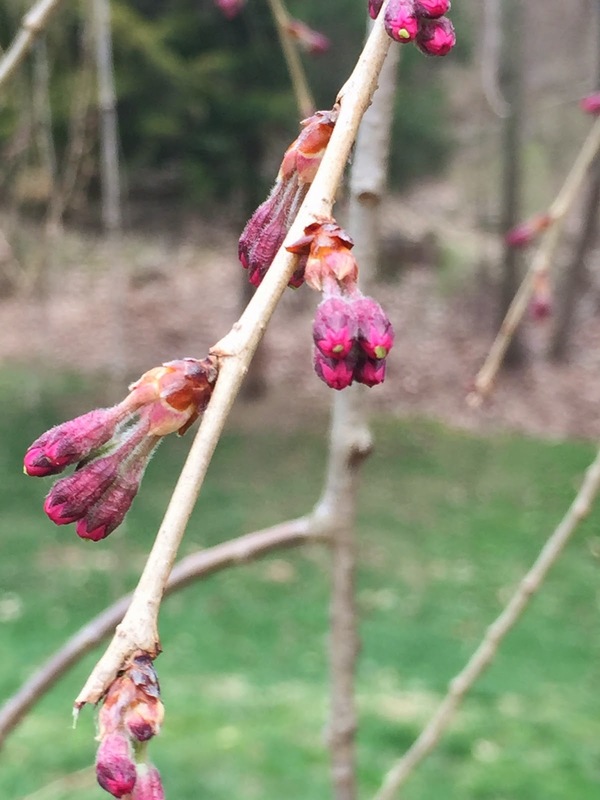 New buds and flowers appear every day and the trees are beginning to leaf. What is also exciting is the opportunity to move outside for the evening to enjoy the weather, like we did around the fire pit last evening. Ending the day with a glass of wine and conversation, without the distraction of electronics, is a way to reconnect and defy the ever increasing pace of life. 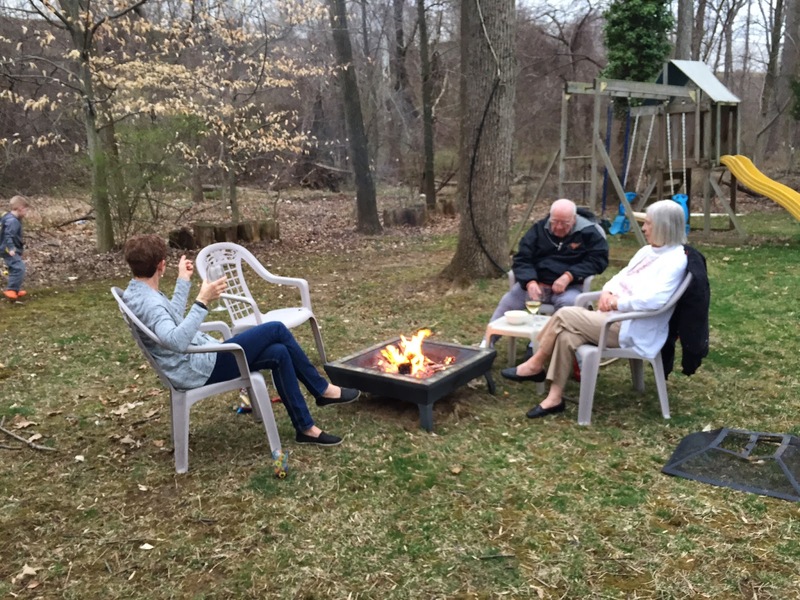 Fire, wine, conversation, relaxing and reconnecting--what could be better? 1. 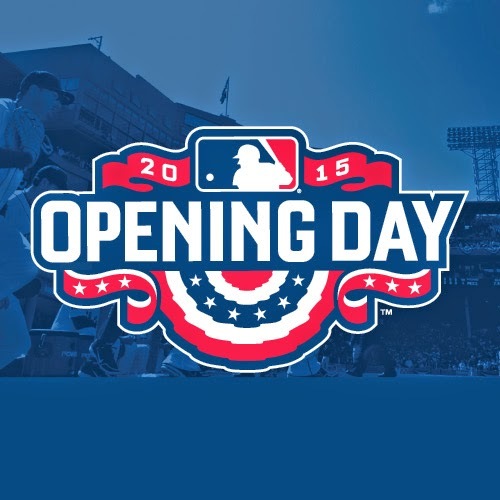 It is officially Spring--Baseball is back! St Louis defeated Chicago last night 3-0 and the most of the rest of the teams have their first games today! 2. Why is it that I don't enjoy new songs during holiday worship services? Am I stuck with beliefs that are too old to enjoy new music? 3. Chaos. 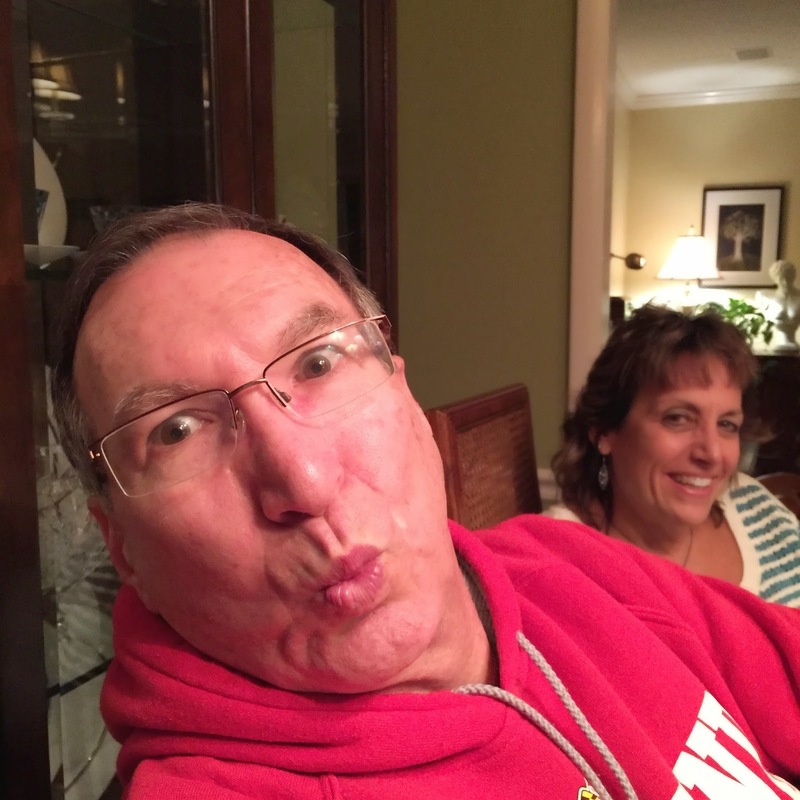 That is what you get when three grandchildren and their families gather along with a couple friends thrown in to celebrate Easter. 4. What do you believe? 5. March Madness is almost over--the final game is tonight--Duke vs Wisconsin. Go Wisconsin! 6. We are an Easter people who live resurrected lives. Springtime has arrived. I notices the trees are casting shadows greater than just bare branches. 7. The hardest question I am dealing with right now is where to go for vacation this summer! 8. I can't believe that Spring Break is over and I have to go back to work today--ugh! I did play four rounds of golf. Good morning or good day on the most important day in all of Christendom. 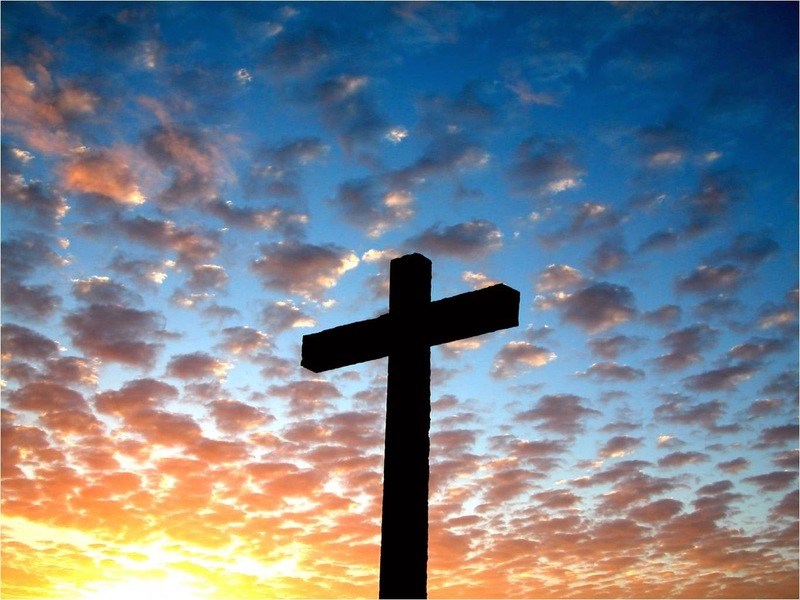 This Easter the murder of Christians around the world at the hands of terrorists is in the news. They are martyrs in the truest sense of the word, killed only because of their belief in the risen Son of God. I know this a downer for the celebration of Easter. But is is happening with ever increasing frequency. I am appalled that the news media continues to refer to the murders as executions--there is a huge difference between an execution as the result of a legal process conducted by a government and the indiscriminate murder of people on a college campus. The use of the word execution almost gives the sense of the result of a legal process rather than the appalling murders that are the reality. I draw consolation, however, from knowing that as believers in the Risen Lord of Easter those martyrs are in the presence of God today praying for those of us left behind to deal with the forces of darkness that are rampant in the world. That is not comforting to the families and friends left behind--for their loved ones have been violently ripped away from them, but it is the promise of Easter and belief in the risen Jesus. During the Good Friday services I attended, I made note of an interesting statement from Mark 15:39, "Now when the centurion, who stood in front of him, saw how he died, he said, 'Truly this man was God’s Son!'" (NET Bible) The centurion was present likely throughout the crucifixion of Jesus. But I noted the word, "was." He said "this man WAS God's Son." The hope of the world today, the hope that comes because of that first Easter morning two millennium ago, is that is is wrong to say He WAS God's Son, because He IS God's Son. We know something that at that moment the centurion could not know. 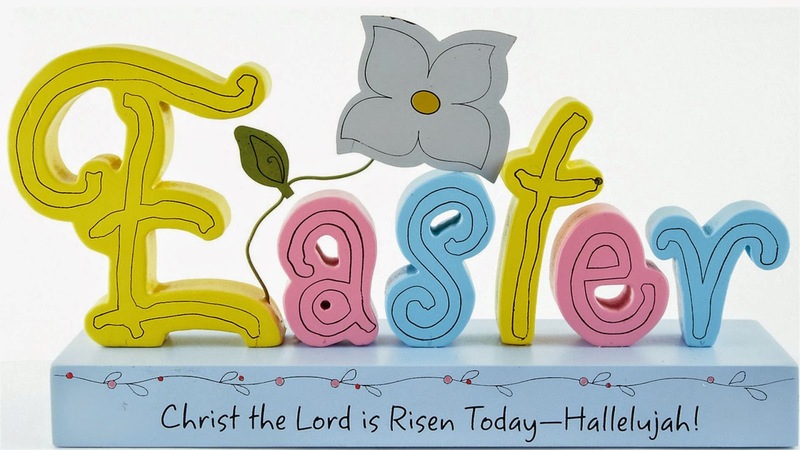 Jesus IS the Son of God--yesterday, today, and tomorrow and because He is risen and alive, we have hope. I awoke this morning to temperatures in the 60's. Phenomenal! Just a few short weeks ago, I woke up to 6 degrees on March 7th! A 50-plus degree difference in less than a month! April is making good on its promise! Warmer temperatures and, of course, rain! Today is supposed to be a washout. I'll take it. It is better than snow. I am beginning to plan the pool opening for late in the month. I need to get the cover off the pool so that I can believe that warmer temperatures are coming--soon. The Orioles home opener is just a week away now--and although temperatures are forecast for the 70's--April showers are also included in the plan for the day. 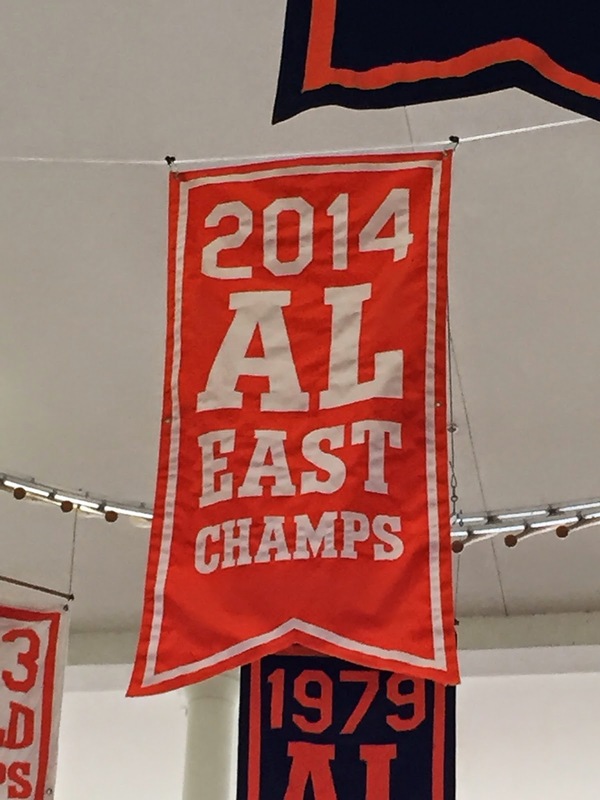 I am sure that even a bit of rain will not deter Orioles fans from flocking to the home opener to cheer on the AL East Champs as they seek to repeat as division champs and improve on their 2014 performance. Excitement abounds. 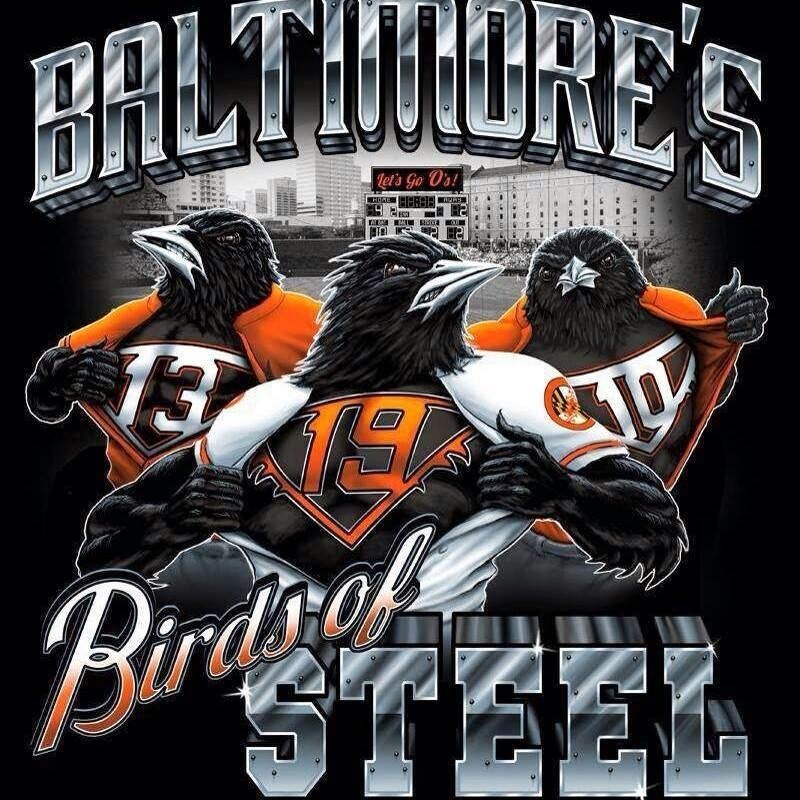 It is too bad that three games will already be in the books before the birds make their initial appearance of the season in Baltimore. 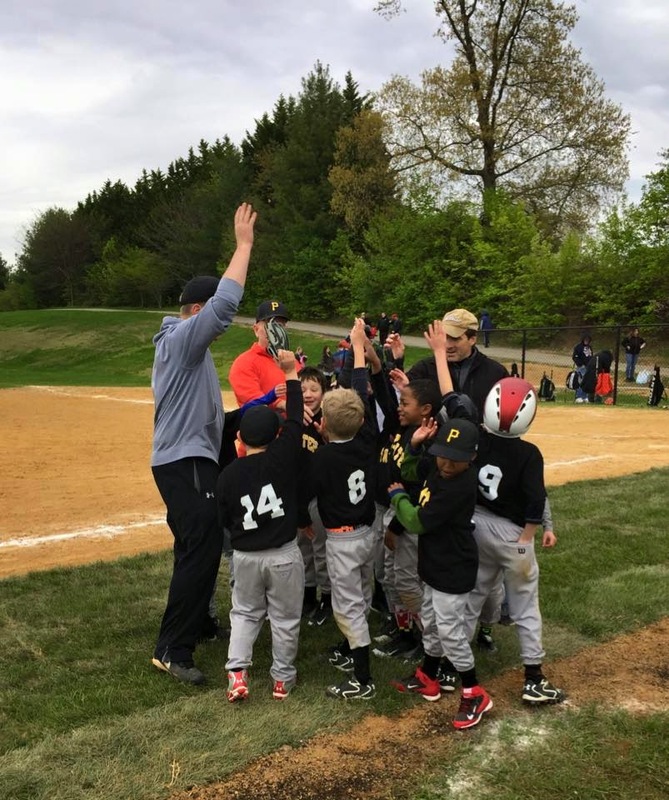 Spring is truly here and as the MLB teams break their Spring Training camps to head north--baseball is in the air and the sports of winter are beginning to wind down to make room for the Boys of Summer. I have my tickets in hand and am ready!